With our diabetes-management-software-SiDiary you can easily import data from your Lifescan OneTouch Select Mini meter and use lots of advantages of statistical analysis, trend analysis and graphics to improve your therapy together with your doctor. 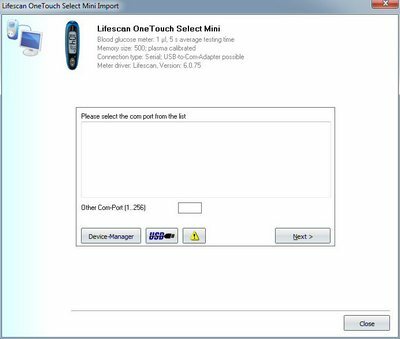 For the data import from Lifescan OneTouch Select Mini, a data cable is necessary, which you can order as an original manufacturer cable directly from an online-shop. For this you’ll need a serial Com-Port or US-Port on your computer.